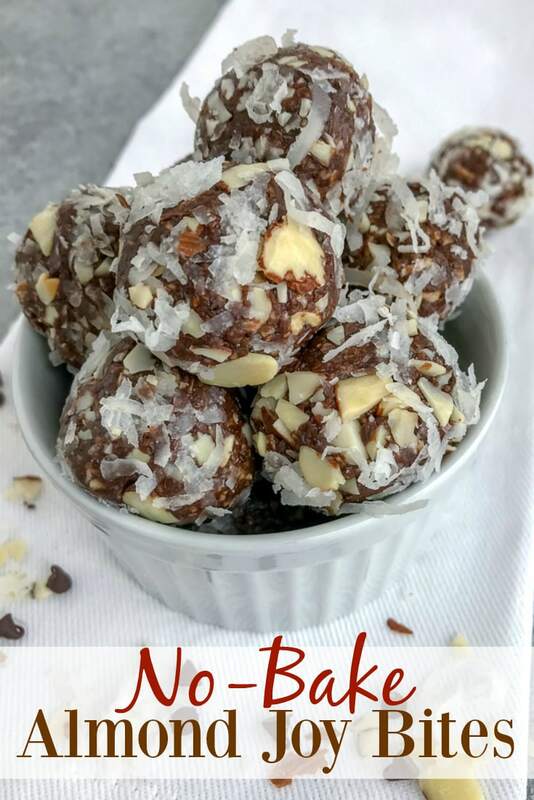 No-Bake Almond Joy Bites are a delightful, delicious and easy! 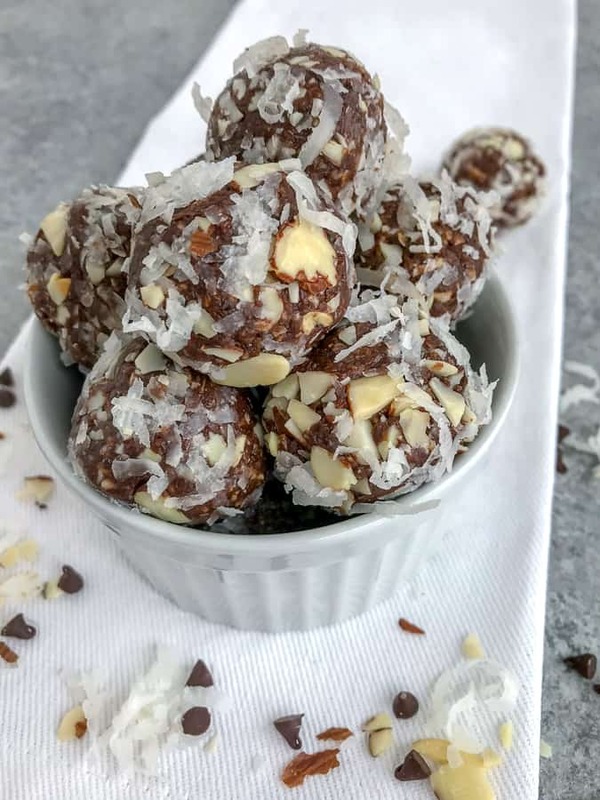 These bites are delightfully simple and come together in 10 minutes and are filled with chocolatey-coconut goodness. Kick your sweet tooth to the curb and prep these to have on hand for a quick snack to grab on-the-go! Are you a fan of Almond Joy’s?? I’m pretty sure you are if you’re on this blog post searching for the recipe! 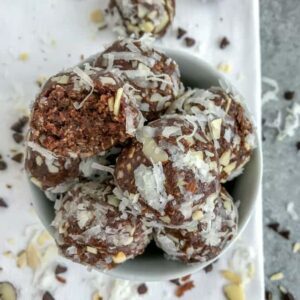 These bites taste just like an Almond Joy candy bar, but they are a much healthier option! 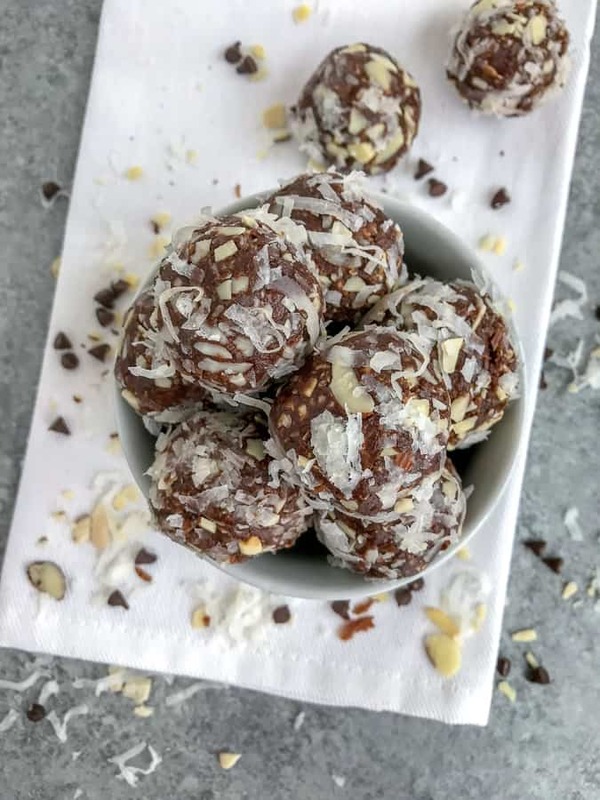 Filled with chocolate, coconut, and almonds, these bites come together in 10 minutes or less. Which make for the perfect to grab when you’re need a sugar fix. In the either years that I have been married, I have yet to find something my husband won’t eat or be ok with. Until coconut came along. He will eat it without complaint, but it’s not a favorite of his, therefore these bites are not something he reaches for when he needs a snack. Score for me! I don’t have to fight anyone for these bites. 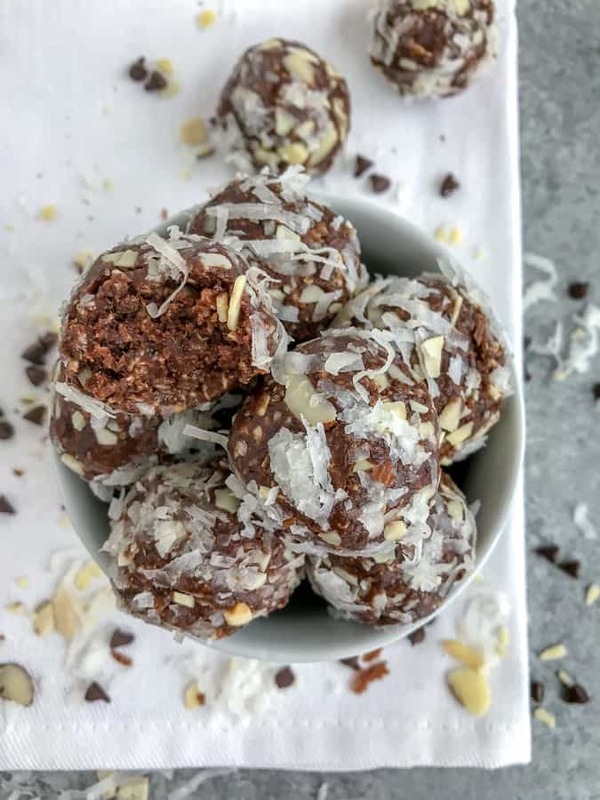 But that only means I have to make him bites of his own, like his current favorite: Healthy No-Bake Peanut Butter Protein Bites. He gobbles 2-3 up at a time! Combine all ingredients, minus sliced almonds and 1/4 cup coconut flakes, into a food processor and process until thoroughly combined. Place into the fridge, covered, for 15-20 minutes to thicken up – if needed. Cookie Scoop – this makes portioning and rolling these bites a breeze! Food Processor – this brand is my favorite. I have had one for 8 years now and always recommend it if you’re in the market for one. Parchment Paper Sheets – no measuring or cutting needed! Simply pull and use for dividing the bites when storing. Glass Food Storage Container – fridge and freezer-friendly containers that I use. 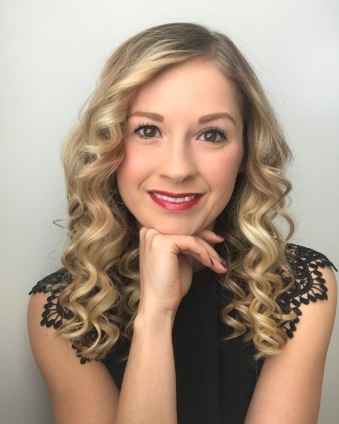 Using a cookie scoop helps to portion out the bites correctly, as well as make the rolling process easier than using a spoon! When not eating, keep these bites in the fridge or freezer. If the mixture seems dry, add 1-2 tablespoons of additional honey or almond butter. If the mixture seems to wet, add a little extra oatmeal. GOT A SWEET TOOTH? TRY THESE RECIPES! 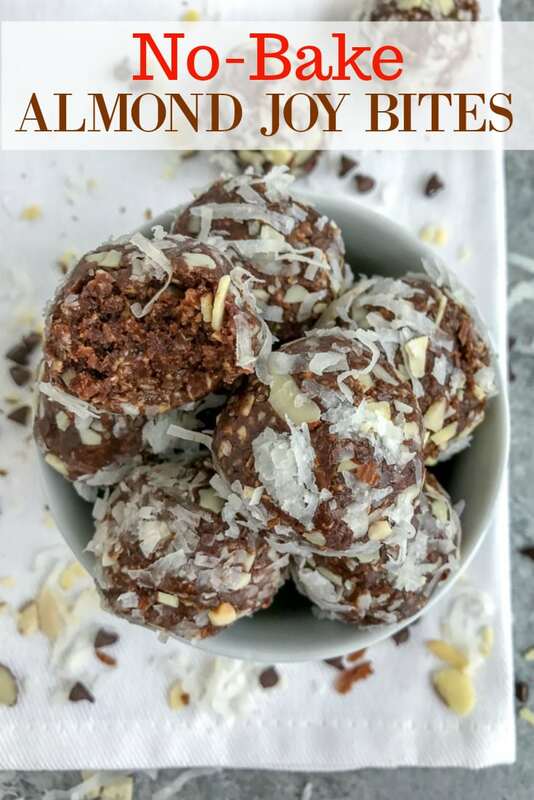 Delightfully easy and undeniably delicious Almond Joy Bites that require zero baking and can be indulged in when you need to curb your sweet tooth! Freezer-friendly and kid-approved!